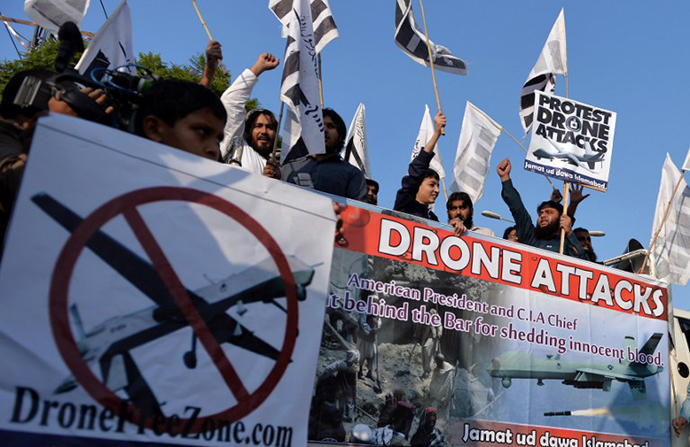 Source: RT.com Protest in Pakistan by those targeted in drone strikes flown out of Ramstein. Crowds numbering in the thousands are expected to protest the operation of flying killer robots from Ramstein Air Base in Germany tomorrow, June 11, 2016. Even Stars and Stripes, a military publication, is publicizing the protests while assuring its readers that the Antiterrorism (sic) force on the base will be ready to handle the peaceful protesters. I'm not sure if any acts of civil disobedience are planned for tomorrow. There are often arrests at drone bases in the U.S., such as Hancock Air Base in NY and Creech Air Base in Nevada as activists attempt to block access to the base, or deliver messages to those in command. Civil disobedience is planned for the protest June 18 at General Dynamics' Bath Iron Works shipyard in Maine. General Dynamics is launching another Zumwalt destroyer, a weapon that cost enough to send 40,000 kids through four years of college debt-free. 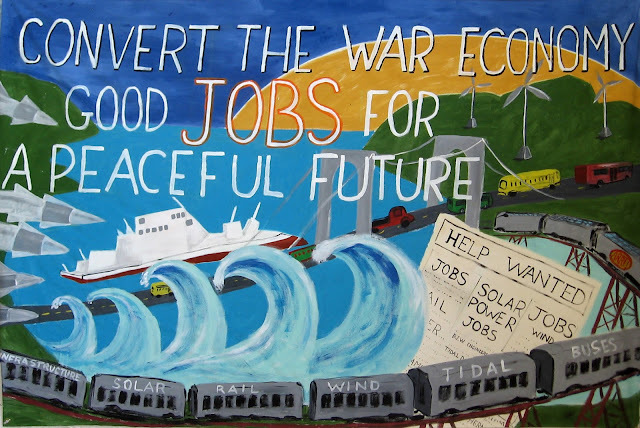 Maine peace activists have announced their intention to commit acts of non-violent Civil Disobedience at the planned June 18 ‘Christening’ of the $4 billion Zumwalt ‘stealth’ destroyer at Bath Iron Works (BIW). A legal demonstration will also be held on June 18 at BIW from 9:00 am to noon along Washington Street in Bath. Speakers and music will be featured. I will emcee the program outside the gates which will feature songs, artwork and messaging from Maine's vibrant peace community. Our program in Bath will likely be ignored by the corporate press covering the Zumwalt launch and the many politicians who will attend. General Dynamics has told reporters in the past that if they leave the shipyard to speak to demonstrators, they will not be allowed back in. I am writing regarding the christening of the Navy’s Zumwalt-class guided-missile destroyer that is going to take place on June 18 at Bath Iron Works. I do not believe many things that the Navy, or the Pentagon states. Those two entities are masters of deception in many ways. However, the designation of the ship as a “destroyer” is one instance where they speak the truth. Does it strike anyone else as being sadly ironic that a vessel that is designed for destruction, including the destruction of who knows how many human beings, would be blessed in the name of Jesus Christ, also known as the Prince of Peace? Human being are not all this destroyer will destroy. How many opportunities for the betterment of the lives of people are being destroyed as our government chooses to spend over $4 billion for this destroyer of lives? That money could do an amazing amount of good if it were funneled into things that actually improve people’s lives, such as education and health care. The government could even put that money into dealing, for once, in a realistic manner with a genuine threat to our national security...the very real threat of climate change, which even the Pentagon understands and acknowledges (not withstanding the fact that it does have the single largest carbon boot-print on the planet). How many lives, among those beings who live in the sea, will be destroyed by this destroyer? It is well known that the Navy’s use of sonar can wreck havoc on the lives of marine species, disrupting biologically important behaviors such as feeding, breeding, migration, and communication. It can raise stress levels, lowering animal’s ability to successfully reproduce, and making them more susceptible to disease. And sonar use can and does result in hearing loss and other injuries, as well as death. Not all sonar victims wind up mass-stranded upon some shore: those that do are likely just the tip of the destruction iceberg. And what of the lives of people living in places such as Gangjeong Village on Jeju Island in South Korea? 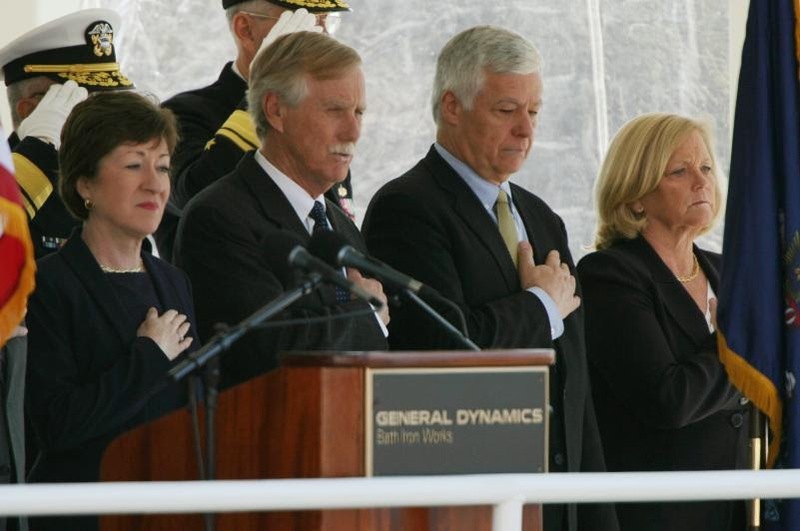 Although the people there overwhelmingly opposed the building of a navy base on their shore, and have non-violently and heroically resisted its construction on a daily basis for going on 9 years, sustaining fines, imprisonment, and injuries at the hands of police, the base is now complete and soon will port US Navy warships. Perhaps this very same destroyer. Those people, who even today continue to resist, have had their village, their sacred places, and their once-beautiful environment destroyed by this base. Yes, this Zumwalt is a Destroyer … of lives, opportunities, and peace. I do not believe the Prince of Peace would ever bless such a thing.